There’s nothing better than spending time outdoors with those you love most, creating life-lasting memories that you’ll cherish for years to come. 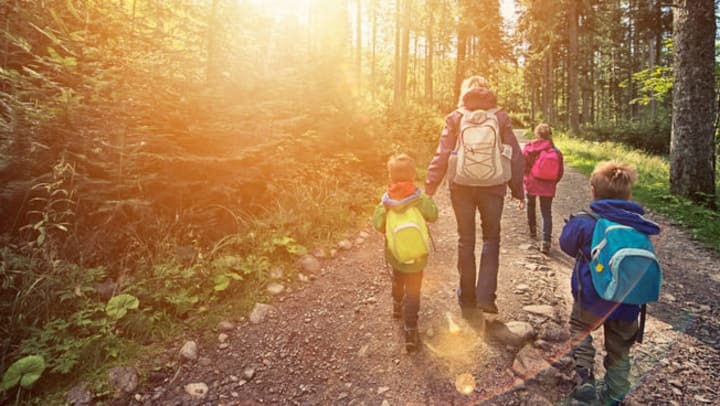 Not only is time spent on the trails great exercise and a chance to experience the beauty of Mother Nature, but it is also a great time to connect with the entire family. Become an expert and learn everything you need to know about gearing up and hitting the trails with kids with these helpful tips. Before you set out for your destination, you’ll have to set realistic expectations for yourself, and the kiddos. While it may be nice to have a schedule and plan of attack, throw your agenda out the door. Often with children, you’ll need to be flexible with plans, and that is especially true when hiking or on any outdoor adventure. Don’t set yourself up for failure. The idea is for everyone to have a great time – so do just that and enjoy every minute, the good and the bad! On that same note, make sure to talk to your kids, and listen intently. Children love being heard and to know that their opinion matters. If you make sure to pay special attention to them before your adventure, during, and after, they will more than likely associate the experience as a positive one, and crave more adventure in the future. Having the right gear for your excursion is the first step to starting off on the right foot. When hiking with children, it’s important to have the most lightweight gear on hand, as parents are most likely going to carry everything. Warm shed-able layers are key! A Backpack/Carrier – For infants and toddlers, you’ll need to invest in a quality carrier that doesn’t break your back, or the bank. Here’s a handy article that breaks down how to choose the carrier that’s right for you. Food and Water – Seems like a no-brainer, right? But if you’re left without any snacks or water, you’ll have one angry child and one frustrated parent. More is better, in this case. Proper Clothing – When it comes time to get dressed, make sure you have appropriate layers, and always check the weather beforehand. If you plan to hike in cool weather – you’ll need all of the accessories like hats, gloves, and jackets. The Ten Essentials – No matter who will be hiking, you’ll always want to make sure you have the ten essentials on hand. Before you begin your hike, you’ll need to decide on the level of difficulty and how far you’ll go. Regardless of age, don’t shoot for much farther than a mile for your first hike. For all ages, start slow, and incrementally up your mileage. If the hike is too hard or far, your child may become challenged and not have a desire to hike again. As a good rule of thumb, most kids can hike about a half-mile for each year of age. Between six and eight years of age, most children can up their miles and keep up with you, if not have more energy and stamina than you. The most important thing to remember when hiking with kids is to have FUN. Before heading out, boost their anticipation of the upcoming hike. Get them excited with the scenery they may come across, like the views, lakes, rocks, and more. Include them in the process. For example, let them pick out their favorite snack to bring along. Show them a map so they can see where they are, and where you’re headed. Out on the trail, let them lead the way! The feeling of independence goes a long way with children. When it comes to hiking, for kids especially, it is the journey, not the destination. Marvel in each magic moment as it happens, and let your inner-kid explore with your little ones. At StorQuest Self Storage, we stand behind the biggest adventures with the littlest people. For all of your hiking gear storage needs, we’re here for you.